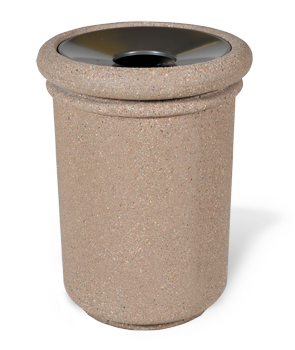 This attractive and stylish waste receptacle will handle 36 gallons of waste, yet takes up very little room itself, making it ideal for both indoor or outdoor use. Heavy-Duty concrete construction deters theft and vandalism. Forms are constructed of metal or fiberglass, and designed to withstand high pressure without distortion. Rigid plastic 36 gallon round liner measures 19-1/2" Dia. x 29-3/4"H and is sold separately. 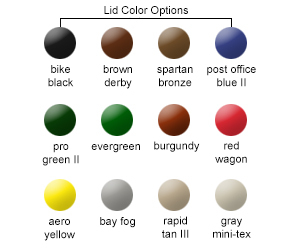 Spun aluminum lid is secured with vinyl coated cable, and can be powder-coated with any of the attractive complementary colors shown in the Lid Color Options. Precast Concrete receptacle is available in the LSB and Etch Finish Options, and is finished with a water-repellent sealer treatment for ultimate weather resistant durability.